Recently I visited Michiel Bechir’s exhibition at Lyric Art Gallery (read here). He gave me an hint and pointed me to an exhibition at LA Gallery called Second Life Blue – and I went there Sunday, March 17th. The exhibition “Second Life Blue” by WuWai Chun is located on the 2nd floor of the gallery. You enter the exhibition through a vestibule with an explanatory text about the pictures and about a charity organisation named Feed a smile, Live and Learn in Kenya”. In the vestibul are 3 pictures, 2 monochrome and 1 coloured picture. 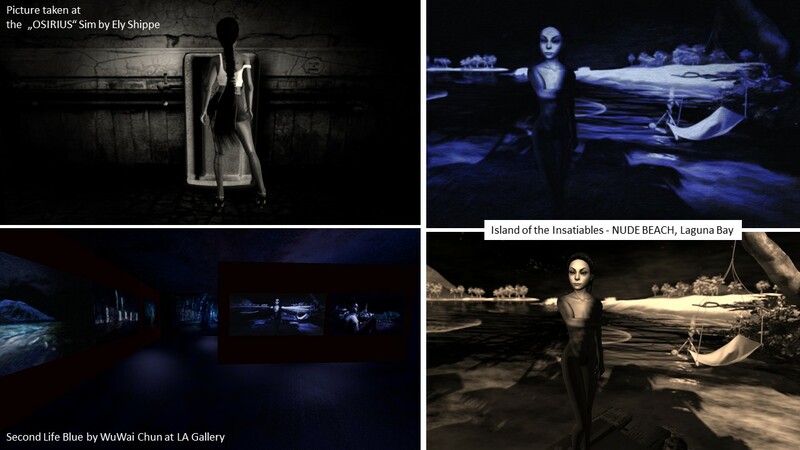 The exhibition “Second Life Blue” itself starts in the next room and contains 12 pictures. As the name implies the exhibition area is submerged in dark blue light and the pictures are also blue-ish. All show art (the one on the poster is from Mistero Hifeng), people or landscapes. 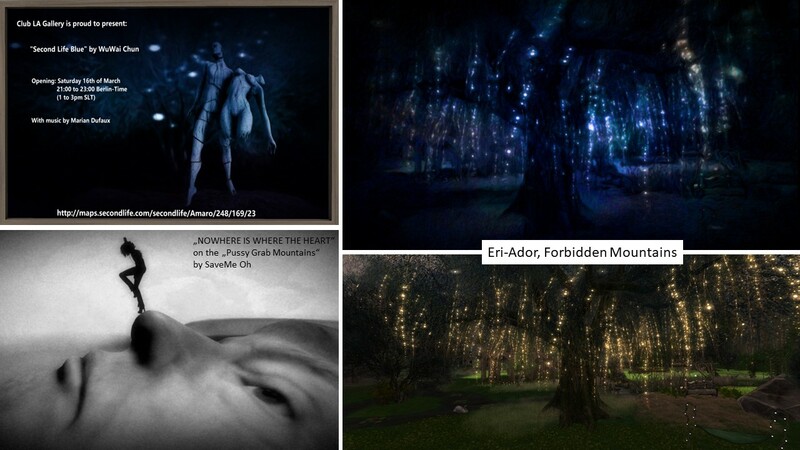 The images are processed from snapshots taken in Second Life and as described before you can look up where the rawcap was taken and you can see the rawcap itself. 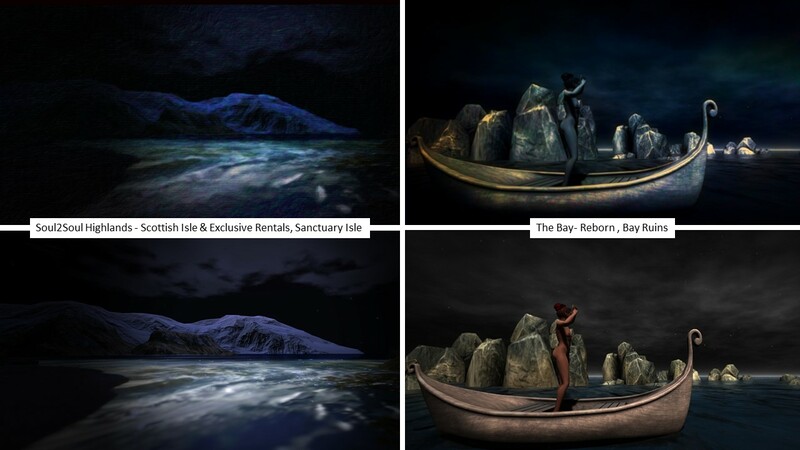 No surprise that the artist, WuWai Chun, describes herself as a creative reporter in Second Life. The exhibition is a fitting selection of pictures and each of them invites you to take a closer look at it. I appreciated that WuWai gave away the places itself and that you could see the difference between the rawcap and the artful result. My personal favourite was nonetheless a monochrome (unprocessed) picture exhibited in the vestibule, showing a girl standing more or less puzzled in front of an urinal. Thank you WuWai for the nice collection of your images and thank you Fuyuko ‘冬子’ Amano (wintergeist) for providing the LA gallery.